Synopsis: The desperate life of an alcoholic is followed through a four-day drinking bout. Did You Know? It wasn’t until years later that Billy Wilder discovered that the title of Charles R. Jackson’s novel is actually a type. It was supposed to have been called The Last Weekend. It’s really too bad that I can’t take a theremin seriously without thinking of cheesy 1950’s sci-fi, because this is truly an incredible film that transcends its own time. 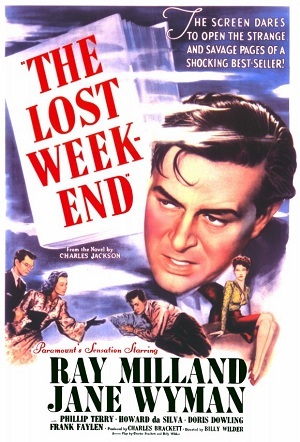 Ray Milland expertly captures the frenetic desperation of a dipsomaniac. But there’s a darkness in the film that is neither alcoholism nor mental illness, but rather the societal taboo of these conditions: the ridicule and condescension that people who suffer from them must face and how they are medically treated.